I am honored and humbled to serve the students, families, team members, community, and most especially, our Elizabeth Board of Education. Elizabeth High School. I understood early on that education was the great equalizer as I witnessed how Elizabeth teachers beginning with my mother who taught for over 20 years in Elizabeth was able to open the doors of opportunity for students. The Elizabeth teachers showed me the nobility of the profession, and the great joy--both given and received when knowledge is shared and futures are planned. I have worked in education for close to 23 wonderful years, serving as a classroom teacher, the Supervisor of Grants, the Supervisor of Early Childhood Education, the Director of Early Childhood Education, and the Assistant Superintendent for Teaching and Learning. I owe a debt of gratitude to our school board who offered me the opportunity to serve as Superintendent. Our school board is accountability driven and has high expectations for student achievement and quality instruction. They have focused on policies to improve those important aspects of teaching and learning while defining clear goals for our learning community. I believe we have a wonderful opportunity here at Elizabeth Public Schools to join together in an effort to help every child achieve excellence. In my experience over the years in Elizabeth, I would have to say that our board is best characterized as having strong shared beliefs and values about what is possible for students and their ability to learn, and of our school system and its ability to teach all children at high levels. The support of this board has translated into giving me the opportunity to select many of the team members who will be part of realizing our vision of being one of the highest performing urban school districts in the nation. The next chapter of the Elizabeth Pubic Schools will be written together with our Elizabeth Board of Education members and the community at large. I envision a culture of our daily work that includes collaboration, conversations, and reflection. We will together define the possibilities for student learning. We will strive to ensure that the next generation of Elizabeth leaders in education and government come from the Elizabeth Public Schools. Together, we will work to ensure that every child achieves excellence. 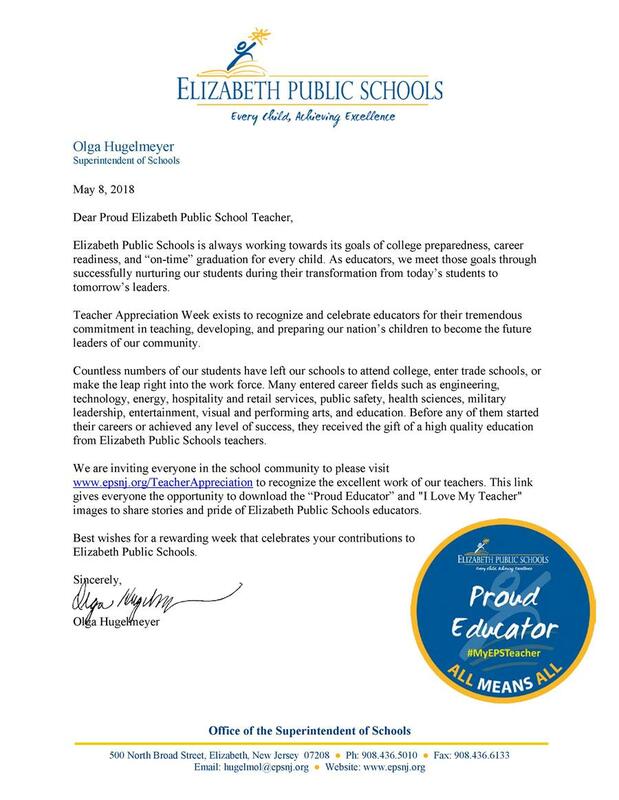 Thank you to all the fathers of Elizabeth Public Schools for your devotion to our students and to providing them with the tools they will need to succeed once they leave our schools to fulfill their ambitions and dreams. Best wishes for a Fathers’ Day that celebrates your countless contributions to all the children in your lives.